Whether you’re sending emails for work or personal, you want to make sure that you are using the correct title capitalization rules for email subjects. You don’t want to send an email to an important client only to realize you made a capitalization mistake in the email subject line. Indeed, subject lines are sometimes deemed as minor details in an email since the content of the email is more important. However, most people still regard subject lines as important because it is the first impression anyone gets from your email and often can be the reason someone opens your email. For instance, a good subject line could help you earn a possible employer’s attention when you are trying to apply for a job while a poorly written subject line could be why your email marketing funnel is failing. Even the slightest mistake in your email subject could completely derail the tone of your email. When you made a slight mistake in the capitalization of your subject, you might have already missed the mark and the receiver of the email may completely disregard the rest of your email. By learning the best email subject capitalization techniques, you will be able to stand out from the rest of the emails crowding inboxes these days. You will be able to communicate with other people more efficiently. In this article, we are going to share to you what you need to know about email subject capitalization. We are also going to provide you several examples so that you could differentiate a good subject line from a bad subject line. In every email, it is important to have a subject line which is easy to read and understand. Capitalizing your email subject lines in sentence case makes them easier to read since the words are easier to distinguish. Hence, capitalizing every word on your subject is really not a good practice. Some people think that subject lines are like titles where most of the content words should be capitalized. Remember, this is not an essay. Treat your subject line as if it is the first sentence of your email. Take a look at the example below. Like any other sentence, you should capitalize the first word of your subject line. Keep in mind that proper nouns should also be capitalized. It’s a universal convention and emails are no exception to this rule. Why is capitalizing your subject line like a sentence important? The reason is very simple. By doing so, you appear more casual and approachable towards the person you are sending the email to. In addition to this, the style is easiest to remember since you only have to capitalize the first letter. You won’t need to be reviewing your capitalization rules time and again. As we have mentioned before, using sentence case in email subjects is a good practice since it sounds more casual. But there are some situations which call for using title case in subject lines. The use of title case is a less common email subject capitalization technique, but it works in many subject lines especially in the business world since it looks more professional. Aside from the words we have enumerated above, you should also capitalize the first word and any word that is more than three letters wrong. If these rules are too complicated to remember, you can always use a free title capitalization tool like ours. The use of title case would make your subject lines more formal and polished. However, you should make sure that your subject line is not too long or else it would be too overwhelming. In written text, it is a universal fact that using all caps would seem like you are yelling. It is really different when you are typing in sentence case like this. IT IS ALSO DIFFERENT WHEN YOU ARE TYPING LIKE THIS. It’s as if you are screaming from the other side of the internet. This is indeed a wrong option, and we do not recommend that you do so. It is a risky move because using all caps in your subject lines will trigger spam filters. Capitalizing even just a word in your subject line could increase the chance that your email would be sent straight to the spam bin. Looking at the example alone, we could safely say that all caps are bad for your email. Just don’t. Weird caps tend to grab someone’s attention, but it comes across as a joke to most people. iMaGiNe gEttInG to rEaD sUbJeCt LiNeS liKe tHiS. It is a very immature thing to do. Most people – if not all – would also treat it as spam and remove it immediately. Should your message be important, people will not be able to read what you want them to read. Keep in mind that weird caps are distracting and should not be used at all. 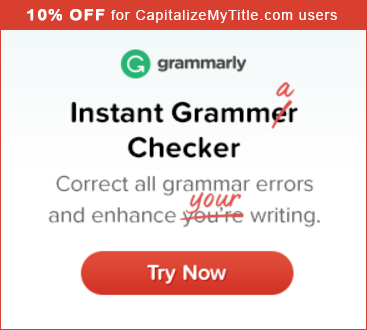 So which is the best email subject capitalization technique to use? While title case is generally more professional, we recommend using sentence case for most email communications since it will allow you to connect better with the recipient.